The Cardinals added some middle infield depth early on Friday by signing free-agent shortstop Ruben Tejada to a one year 1.5 million dollar contract. Tejada, who is 26 years old, was placed on waivers by the New York Mets earlier last week. Prior to being waived by the Mets, Tejada was scheduled to make $3 million in the upcoming season. There was speculation earlier in the week that the Cardinals would submit a waiver claim for Tejada after learning all-star shortstop Jhonny Peralta will be out until the middle of the season with a thumb injury. If the Cards had claimed Tejada off waivers, they would have been on the hook for the entire $3 million owed him. When Tejada cleared waivers, however, he became a free agent, and a new contract would have to be agreed upon. Tejada was signed by the Mets as a 16-year-old from Panama in 2006. Throughout the early part of the decade he was considered one of baseball’s top prospects and the heir apparent to shortstop Jose Reyes. Tejada made his major league debut in 2010, playing in 78 games primarily in a backup role with 216 at bats and a .213 average. The following two seasons, however, Tejeda seemed to blossom into a major league talent. In 2011, he played in 96 games with a batting average of .284 and an on-base percentage of .360, and in 2012, he played in 114 games, batting .289 and was on base at a .333 clip. The Mets fell out of love with Tejada the following season, questioning his work ethic and motivation, and after a poor start to the 2013 season, Tejada was returned to the minors for what the team called “poor conditioning.” Tejada was told to slim down and get in better shape prior to the 2014 season, which he did, however he never regained the stats from the prior seasons. In 2014 and 2015, Tejada played in a combined 235 games with a .249 average. For his career, Tejada is a .255 hitter with 10 homeruns, 99 doubles, 148 RBIs, and an on-base percent of .330. He has 328 career strikeouts compared to 187 career walks and a total of 16 stolen bases (out of 27 attempts). Despite the declining offensive numbers, the Cardinals needed to find someone to fill the role of Peralta until he returns from injury, and Tejada has more experience at short than possible in-house options Jed Gyorko, Greg Garcia, and Aledmys Diaz. With the high amount of ground balls the Cardinals pitching staff generates, that experience will come in useful to the club. Manager Mike Matheny said Friday that the team was looking for a shortstop “to catch the ball and make plays.” When describing Tejada, Matheny stated, “I like what I’ve seen. And I also know that he’s out to get better, too. This is a great place for him to work and get better.” Under the tutelage of Jose Oquendo, that may certainly be true (don’t forget, a few years ago, there was significant question about Peralta’s defense). Oquendo may have his work cut out for him, however. In 2015, Tejada ranked near the bottom in most defensive categories among MLB shortstops. This may be an outlier year, however. In earlier years in his career he was considered an average to slightly above average defensive player. Tejada will also provide the team with some versatility. He is best used as middle infielder with 397 career games as a shortstop and another 110 at second base, but is also capable to spot at third, where he has 18 games. This versatility will be a welcomed benefit to the team that saw both middle infielders wear down by the end of last season. This will allow for some rotation between Tejada, Gyorko, Kolten Wong, and possibly Matt Carpenter to help keep players fresh (Greg Garcia will also likely be in the mix as well). This may be especially true against opposing lefties; Tejada bats a career .281 against left-handers, thus I expect him to be used to spell Wong at second base on many of those occasions. 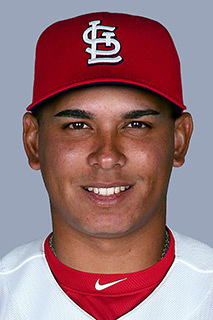 With the acquisition of Tejada, the Cards sent Aledmys Diaz to triple-A Memphis Redbirds spring camp. Having gone down to double-A Springfield many times over the last two years, I have become quite the fan of Diaz, and I can say this is a good move for him. He is still refining his swing and he needs to play where he can get 3 at-bats a day, which was not going to happen in St. Louis (yet). Diaz currently has no major league experience and only has a small amount of time at the AAA level, which he got near the end of last season. During that time he had 50 at-bats where he batted an impressive .380, and it looks like he will continue to improve for a probable call-up later this season. Overall, this is probably a good move for the Cardinals. It is pretty low risk, at only $1.5 million and one year. If Tejada doesn’t work out, they can cut ties to him in a couple of months and use Gyorko and Garcia to back up Peralta. If Tejada regains some of what led him to be a top prospect, he is only 26, and the Cardinals could be in a prime position to give him a long-term extension. Tejada likely has significant incentive to perform as well, as this year may well be the crossroads in his career. If he is cut a second time in one season, he may find it hard to find a job in the future, but if he plays well, there will likely be many suitors for a young productive shortstop. Either way, the first three months of the season promise to be very interesting at short.